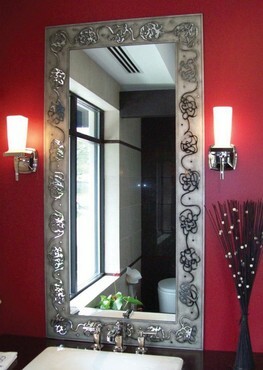 As one of the leading providers of mirrors in the chicagoland area. We offer a wide range of custom mirrors — everything from a standard mirror in a bathroom to custom mirrored wall in a fitness room. There really isn’t anything that we can’t accomplish in this market. Continue below to see just a glimpse of some of our previous projects. 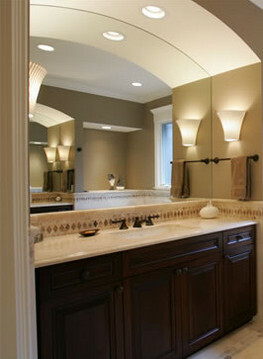 All of our mirrors are custom cut in house — which is great for price and lead time. In this bathroom we installed a mirror that goes from wall to wall and was cut to have a large radius on the top to form to the ceiling. Stunning. Believe it or not the frame around the mirror is actually apart of the mirror itself. We have full-time designers and artisans on staff that can bring any design or concept to your glass. Click on “Custom Decorative Glass” to the left to see what else we are capable of!